I think I prefer Pepsi, but Coca Cola is looking kind of cool these days. 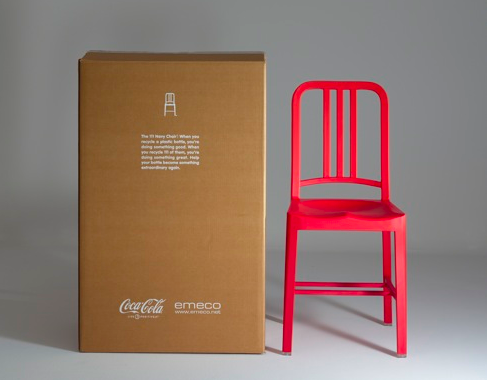 The company has teamed up with the eco-cool Emeco to make the "111 Navy Chair" (aptly named because the chair is made out 111 recycled PET soda bottles. The chairs come in several colors, such as red, dark grey, lime green and white. 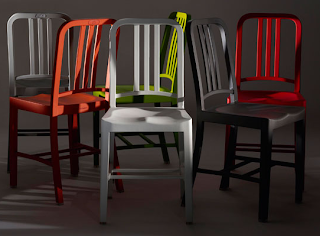 From the website: "The 111 Navy Chair® will retail for about half the price of the aluminum 1006 Navy Chair. You can buy it now, and we will start shipping in June. Find a worldwide dealer below. If you don't see your country in the list, please email us at coca-cola@emeco.net." This means the price will be about $200 or so! Not bad at all! !